Water lilies are deep-water plants that are popular in water gardens around the world. A perennial freshwater herb, the lily grows in temperate and tropical climates.The plant is native to the eastern portions of North America and southern Canada. The fragrant water lily was introduced as an ornamental plant for water gardens in the early 1800s, and is now grown throughout North America. 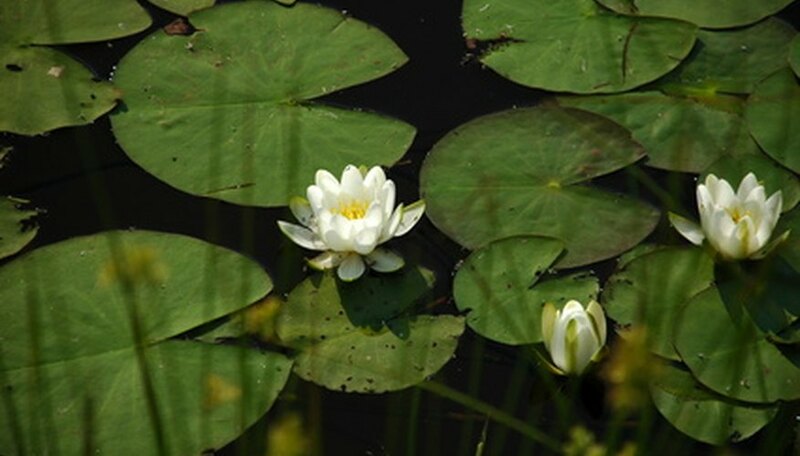 Other varieties of water lilies are native in different countries. Hardy water lilies can remain outdoors even in winter in temperate climates. Tropical species of water lilies are considered annuals. The leaves and flowers of the water lily float on the surface of water, but its rhizomes are rooted in soil below the water's surface. Though its leaves and flowers vary depending on species, all water lilies have a singular bloom, usually in shades of pink, red, white, yellow or blue. The water lily is in the family nymphaeaceae, and has more than 70 species, including both hardy water lilies and tropical water lilies. Hardy water lilies include the nymphaea amabilis, which has star-shaped pink petals with lighter tips and yellow stamens and round green leaves. The American star has star-shaped pink petals with yellow stamens and reddish-purple leaves. The nymphaea aurora has cup-like flowers with petals that change from yellow-apricot to orange-red, then deep burgundy-red on the third day; its leaves are green with purple blotches. Tropical water lilies include the blue beauty, which has star-shaped flowers with mauve petals and yellow stamens, and dark green wavy leaves. The tropical nymphaea afterglow has flat, sunflower-shaped flowers, yellow petals and golden orange stamens; its round green leaves are wavy and have purple undersides. Water lily flowers vary in size but are generally in proportion to the leaf. They range from 1 inch in pygmy varieties to 12 inches in some tropical hybrids. The plant itself can spread from 1 to 5 feet on top of the water, depending on the variety. The nymphaea grow in ponds, lake margins and slow streams. It will grow in both acidic and alkaline fresh water. The fragrant water lily is an invasive species. If not controlled, the plant reproduces quickly and takes over lakes and ponds. Harvesting the plants or covering the bottom of the pond with an opaque material helps control the water lilies. Herbicides can be used, but are harmful to other plants and animals. The water lily provides a natural habitat for bass, sunfish and frogs, providing shade from the sun during hot summer months. In wild habitats, beaver, porcupine and moose eat the leaves. The flowers appear from June to September. Most blooms open in the morning and close in the early afternoon, although some varieties--such as the maroon beauty and Jennifer Rebecca--bloom at night. Flowers will bloom for two to seven days on most varieties. The flower stalk will appear to corkscrew beneath the water's surface after the bloom. Deadheading the spent flower will encourage another bloom during the season. The water lily reproduces through rhizome spread and seeds. In the home garden, nymphaea rhizomes can be cut for propagation. 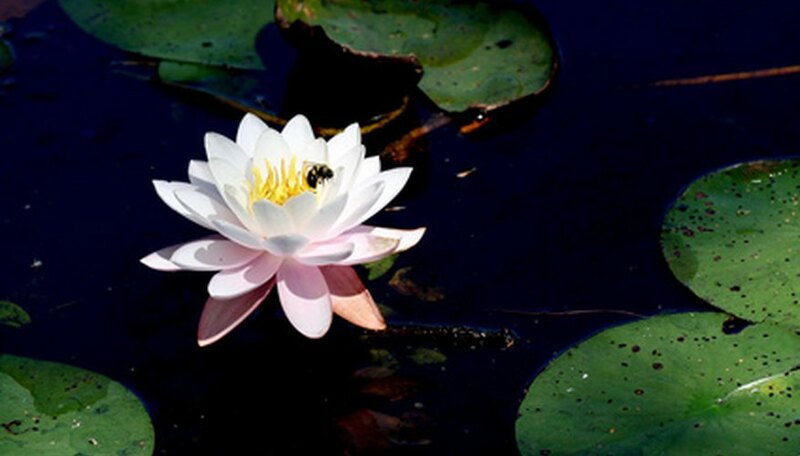 Beetles are the primary pollinators for water lilies, but bees can also play a role in pollination. 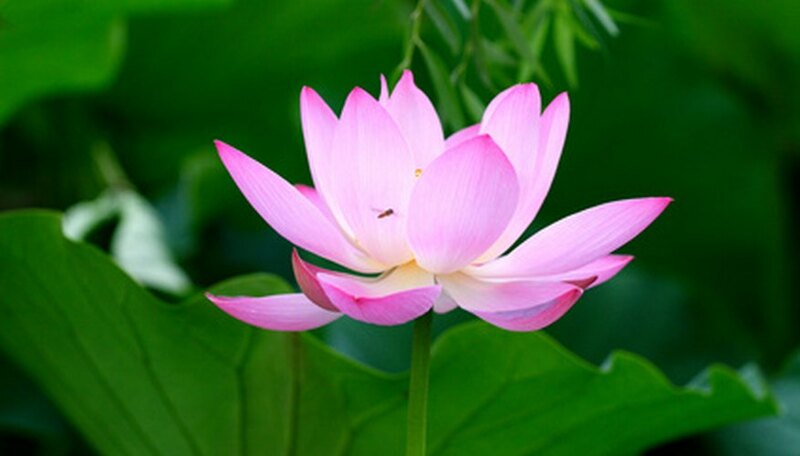 The lotus and the water lily are often confused. The lotus is from the genus Nelumbo and has two species; nelumbo lutea and nelumbo nucifera. The easiest way to tell the difference is to look at the petals and leaves of the plants. 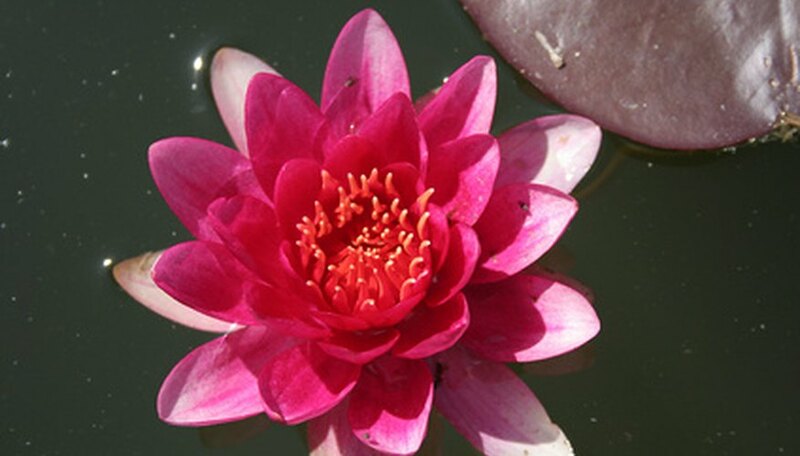 The flowers of the water lily have sharp petals, while the lotus has rounded petals. The leaves of a water lily are flat and sit on the water. Leaves of the lotus plant rise above the water. "A Practical Guide to Pond Plants and Their Cultivation"; Derek Lambert; 2003. "Easy Care Water Garden Plants"; Charles W. G. Smith; 2001.